This page includes news and media coverage of the proposed development. If you would like to receive updates about this development, please sign up here. Proposals for a 3,800-home development in West Ham are going on display for a second time. The site of the former Parcelforce depot in Stephenson Street is being redeveloped by Berkeley Homes, and residents in the surrounding area are being invited to have their say. 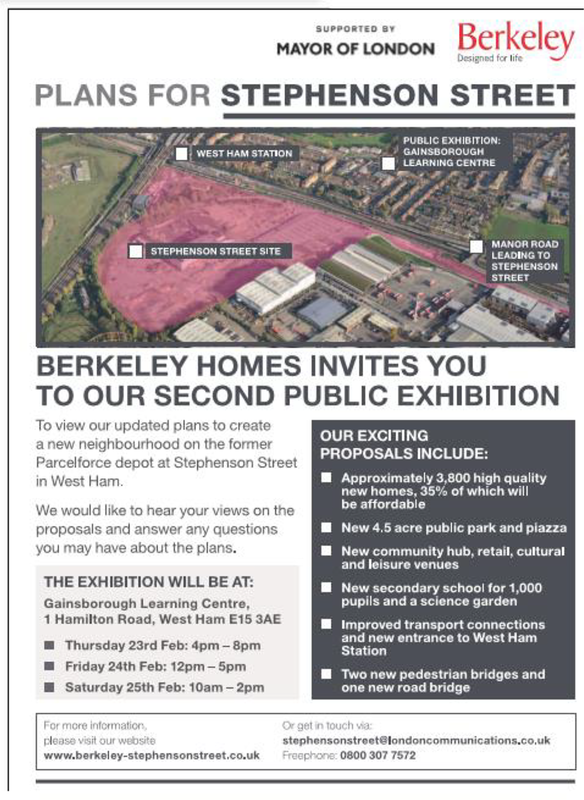 A three-day public exhibition will take place at Gainsborough Learning Centre, Hamilton Road, West Ham. The first will be today, between 4pm and 8pm, with further sessions taking place tomorrow between 12pm and 5pm and Saturday between 10am and 2pm. It follows an initial consultation in May last year. Mike Nisbet, development director at Berkeley Homes, said: “Berkeley Homes want to ensure that local people genuinely benefit from our exciting plans to transform this disused site into a new neighbourhood. “We have listened carefully to the comments received at our first exhibition in May and would like to encourage members of the public to come along to this exhibition and continue to share their views with us. A secondary school, a 4.5 acre park and retail spaces are also planned for the development. Details about a 3,800-home development close to West Ham station have been revealed as part of a public exhibition. Berkeley Homes, who will be converting the former Parcelforce depot at Stephenson Street, showcased their plans for the site ahead of submitting them this spring. Among the plans would be two new direct connections between the site and West Ham station – one near the Jubilee line escalators and another to the main ticket hall. Another pedestrian bridge will be built further away from the station, crossing both the track and the parallel Manor Road to provide a safe crossing place. East London Science School – currently in Bromley-by-Bow – will occupy a plot at the south of the site, where it will provide a secondary education for 1,000 pupils. “They have been looking for a permanent site for some time,” explained Edward Priestly, development manager at Berkeley Homes. “It should be ready to open in September 2020. The first phase of the development, which has an estimated completion date of 2022, will include a public piazza, parts of the Four Seasons Park and Science Garden communal areas and 1,000 homes, as well as the rail connections and the school. The final public exhibition session, at Gainsborough Learning Centre, Hamilton Road, West Ham, will take place tomorrow between 10am and 2pm.